In the year 2636, the Alien War continues, and it's up to two soldiers, Jimbo and Scully, to put a stop to the alien invasion. The aliens have ravaged the Earth with their powerful organic and technological weapons. Players can join with a partner and battle through six stages of nonstop, run-and-gun action. Collect power-ups, including bombs, flamethrowers, spread shots, lasers and machine guns to take out the aliens. Control Jimbo and Scully as they travel through war-torn cities, race on air bikes, ride missiles and ultimately break into the alien base to defeat the alien boss once and for all. I'm finding even after all these years of not playing this now i return to it i am still the don at it. what i love about this game is it's just non-stop action. like a arnie film theres just one more bad boy after another.... the characters u play are so nimble that when u die u can't argue and say it's not your fault. top tip, keep a C weapon in reserve for bosses and use the S for general blasting! I've never played it before, and I wasn't really sure what to expect when I downloaded this a few weeks ago. I must say, I was very surprised at how playable it is! It's the best game of it's genre. This game will provide a challenge but it is incredibly frustrating to play. I would recommend anyone considering this game for the first time to get Gunstar Heroes instead. The weapons are more imaginative, the levels are longer, the hit system is more fair, you have the ability to engage enemies in hand to hand combat and throw enemies into one another for combo kills. And, most importantly, it's fun to play. Having never owned a SNES I downloaded Contra 3 (Super Probotectors) after hearing people rave about it. I have to admit I was actually really disappointed by the experience. For starters the button arrangement on the gamecube controller is very uncomfortable (though I understand this problem plagues many of the SNES titles). Why we are not given at least the option to customise the controls ourselves is an inconvenience. The one-hit-kill mechanic left me feeling cheated. Considering the game drops you right back into the action anyway lives are just an elaborate way of assigning you 7 hits worth of health until you have to use a continue and start the level over. That would be fine if the game didn't steal your bloody weapon every time you get hit! I never seem to get enough time behind any of the weapons for them to be effective. I am generally skilful at games but this one is brutal. The third level has a boss that clings to the wall and tasks you with shooting at a tiny eye (which opens and closes quickly) attached to a drill that moves up and down more quickly than you can. Every time you line yourself up to shoot at the eye you place yourself in position for the drill to crush you without warning. You can sometimes dodge the drill by letting go of the wall and falling but you have to grab the wall again before you fall into a pit of spikes below you and sometimes your character refuses to grab the wall again. Once the drill hits you twice you have only your standard gun which means you have even less chance of hitting the eye. 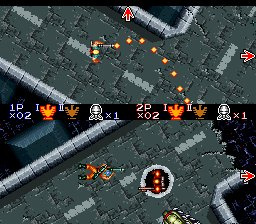 That said the overhead mode 7 levels are quite unique and might be worth checking out to see what the SNES was capable of in it's day (though note that the screen is divided horizontally rather than vertically for multiplayer games which is very strange). I can't see this game on my VC list. I'm a UK Wii owner. Is a shame as I really want to download this. This game is Contra in what is possibly the game's most glorious form. I am a huge Contra Fan. I own every Contra Game from NES on through ps2 (yes even Contra Force) This title is by far my favorite. Change the difficulty to hard and give yourself only three lives and you will have the time of your life trying to make your way through this master piece. Tandem that third level enemy was not a boss and you do not need to let go of the wall you can just move out of the way and then shoot him diagonally. I cannot recommend this game for everyone. It's way too hard. But full of excellent action. 4 stars because even on EASY it's unbeatable. SCkkKatTTrrRrbrain: You wimp! keep practicing, it isn't THAT hard! Awsome game! The running... the shooting... more running! MORE SHOOTING!! 4 stars... not 5 because of a low replay value IMO! It's called 'Super Probotector' here in the UK! Far better than Gunstar heroes there is a real sense of atmosphere in this game thanks to far better level design, you can store 2 weapons and can use bombs. Hmm... I know the games Super Probotector and Contra III are basically the same... but wasn't there two robots in Probotector instead of the usual characters? 4/5 due to the difficulty that may repel new players. 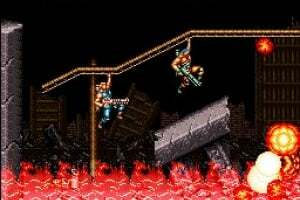 Now, when are we going to get Contra: Hard Corps? Keep an eye out for Contra 4, which is coming out on the Nintendo DS soon. 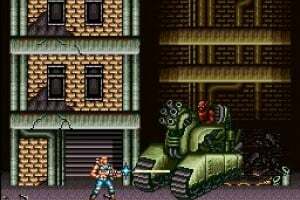 I always thought Contra hard Corps on the Genesis was way better. I still remember buying this game back in my SNES day when i was just a kid and i played it all the time. How very fortunate it is that it has come to the VC as soon as it has. I downloaded it as soon as i saw it. One of the best games ive ever played. Brilliant action, sound effects, music and bosses. A classic. Hmmm i never played this version before. Ive only played Super Contra and Contra (the original). I only managed to finish contra the original. Anyone know if thats coming to VC. Im going to get this though probably. 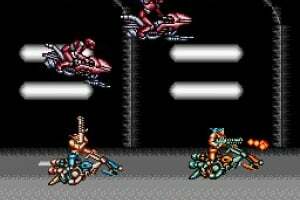 I can't believe us UK gamers got the robots, at least I played the US version with the proper Contra characters. Anyone know why they swapped men for machine? Love this game, first class. When people think hard games, they don't think of anything from this generation. They think of games that were made back when players weren't spared their worldy abilities. They usually think Contra 3. 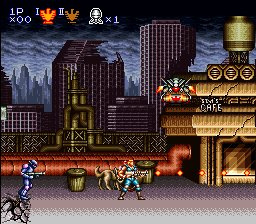 And the reason why Contra 3 is so unusual is because it is actually a great game. Most of the hard SNES games were also complete crap, ruined by the constraints of clueless developers who don't know how hard is too hard. 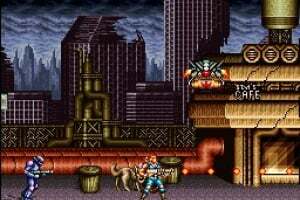 However, I have a feeling that upon completion, the developers who crafed Contra 3 (the remnants of which went on to be the ashes that Treasure sprung out of) had some idea of how ludicrously hard the game is. And to people first picking it up, the difficulty is downright ridiculous. 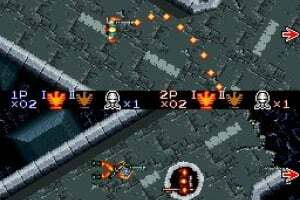 The game is a futuristic sidescrolling shooter, with a myriad of powerups (all of which are great), well placed enemies, and excellent mode seven graphics. But the catch is, one hit kills you and not your enemies. So at the expense of having some truly awesome weapons, you are given a fragile mortal coil. And when there are stray bullets flying every which way, any of which can just barely graze your foot, you have a lot to worry about. Every level is filled with completely unique situations that need to be worked through in special ways, and the only way to get better at the game is to keep on playing and know what you are doing and how to handle each levels unique situations. Finnesse is key as well. So how do you take down the game, especially when the famed Konami Code is not present? You call on a friend. Yep, the game is two player co-op. You will most likely need a friend to help you completely can all these aliens. This is one of those games, like Battletoads, that if you beat you will feel completely accomplished about. Not only an excellent game, but also a game for those who take games seriously. Marvelous game... But playing it with the GameCube controller just takes away all the fun. They changed the standard action men into robots because Konami feared that such a "violent" game (by past standards) could be in Europe and almost certainly in Germany added to an index, which would be a commercial disaster. 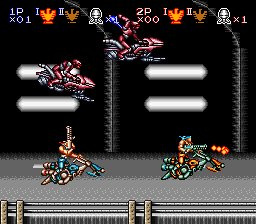 Contra: Hard Corps for Mega Drive was the last one to get this treatment, but the only one that lost a lot of its story (it had one) and character (no female, Colonel Bahamut has a pencil for his head). Retro - you could try putting the game on easy with 9 lives in the options. Better still get a buddy to play co-op with you, that's the best way to play this game and it does make it easier. Hands down one of the best games of all time. I thought the changed them to robots because of a terrorist group called the Contras who were pretty infamous at the time. Amazing great fun old school action game. This is definetly one of the top of it's kind. It's all about memorizing and learning levels and bosses pattern to get anywhere in this and everytime you'll get just a bit further. It's a very fun and great game to play co-op in so if you have a friend and a extra controller this is one of the must haves. Be warned though the the controlls work very weird with the Gamecube controller but perfect with the Classic controller. The game works a bit different then others, that I have played anyways, as you have no energy or life bar and die in one hit but it's possible to not get hit at all the better you get. More realistic if you can call it that and you feel like a better player when actually getting anywhere. You can set the difficulty and life total yourself to best suit your own preferences so there really is no reason not to be playing this. 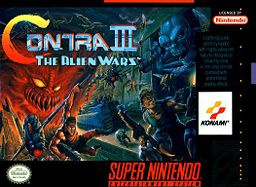 Contra 3 has to be one of the most ridiculously intense games I have ever played. It is one of the best action games I have ever played. The game doesn't let you take a breath, it keeps you going until you beat it or you died. Brilliantly frantic and intense, with plenty of well though-out bosses. And even better, it's aged very well, with sharp controls. If you're a fan of difficult action games this one is a no-brainer. Great graphics, music, controls, etc. It's all here. Easily the best of the old-school trilogy. Plus, you get different endings for each difficulty. My biggest feat was beating this on normal with three lives. Haven't been able to beat hard yet. This game is the best shoot em up I've ever played! With two players it's really awesome and for those who complain about the difficulty... better start training those thumbs. sweet game. was the first game i got on my wii. So is this suposed to be the all time hardest vc game? Nah, I'd say that goes to R-Type. I remember this game being rock hard when I played it on the SNES, so I was wondering if the easy difficulty is very easy or still quite difficult? The warnings of the game being "solid" and "rock hard" are putting me off this, but i wont a contra game so bad! @Rossi - Contra III is hard, but fair. You can lower the difficulty setting and give yourself more lives if you really struggle. With a bit of practice its not too bad really and much easier with a second player. Yeah, its fun. Even if you can only do the first few levels of the game, its still more entertaining than many VC games already available. 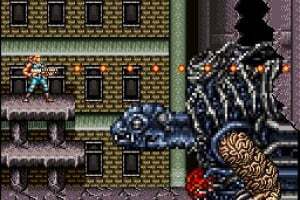 Also, I wonder when we'll see the Genesis Contra game on VC. Love it, only mine is called Super Probotector. I think the robots are pretty cool!! It's the only Snes game i finish within 15 minutes on easy. Even in 1993 i was good at it. Still a favorite. 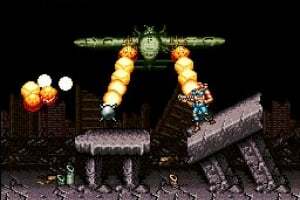 And i can tell u: Contra 4 (DS) is wayyyyyyyyyyyyyy harder than this one. Finished in 15 minutes on Easy? Try again using Hard difficulty and see if you can finish the game in 15 minutes -- because playing on Easy doesn't count! 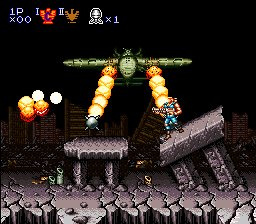 Contra 3 brings back a lot of good memories, and it's nice to see that it's still as tough (but fun) as I remembered! 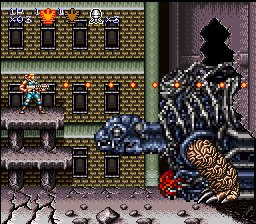 However, playing this game makes me realize just how superb Contra 4 really is on the DS! 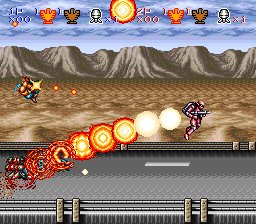 Had the japanese version of this game.Don't remember it being hard.But going back to old school games now, I'm struggling like a dog. You really do need 2 players to get this game at its peak. Still, I downloaded it and initially was a bit dissapointed as it was insanely hard. However, to play this game well you need to replay it a bit and learn how to fight the bosses more effectively. 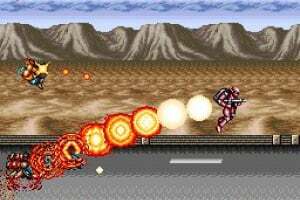 This game has some of the best boss fights ever, from leaping from missile to missile while fighting an alien ship, that huge dinosaur to the terminator robots, if I had a complaint, its that the last level bosses aren't as fantastically creative as the rest of the levels, and that the top down levels just don't compete with the side scrolling levels in terms of fun. The last level looks H R Gieger inspired, like something off the set of the movie aliens and all in all the side scrolling levels are graphically pleasing to the eye, even for an older game. In its day easily a 5/5, but with dated graphics and the difficulty a 4/5 today. This looks like a cool game, kinda like metal slug. But the heard the games has a short story ans u can beat it pretty quikly. But it still looks like fun. This is such an awesome game! The only thing that could top it for me is if Hard Corps was announced. I'd buy that in a flash. Works great with the classic controller. Brilliant game, played it since it first came out. Was really hard when I was younger, and it is still a challange, however, now able to finish the game on hard generally very easy - but the gameplay and replay value is still enjoyable! Having a second player also is really fun. 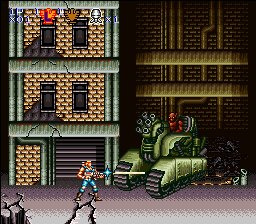 The music in this game is brilliant, the end of game boss is also, personally I think this Contra is the best one, the others seem like parodies and very poor musically and enemy design wise in comparison. 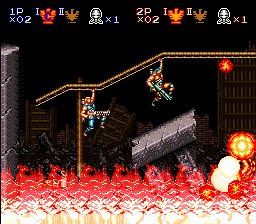 Uranian Devil Gappa is a great end of game, compared to the ones I've seen on other Contra games. The music for his battle is good too - it is very military sounding. For more of a task, try playing it on Easy, Normal and Hard back to back. Oh and Tandem, the reason you can't alter the controller settings is obvious. Nintendo want people to buy their Classic Contoller, because they know Snes games will be easier to play on it. You are incredibly fun to play, you're good looking, you sound good . . . and you are too damn hard. It wouldn't be so bad if the continues weren't limited. The fun-factor is through the roof, and it's full of clever, memorable, even epic moments of action. Of course, high difficulty makes flaws stick out, like the overhead sections are kind of questionable. But there's no question about the fact that it's incredibly tight game design--great control. This game is full of something I personally dread seeing in action games: Level memorization. There is just plain no way somebody could ever beat this game on the first try; foreknowledge required. BUT: the game is very enjoyable to start with a very nicely-balanced easy mode. Then, once you know how the game is (it's actually really short, just six stages) normal starts adding layers of challenge onto the ones you've already done. And hard mode is absolutely nuts . . . I haven't yet beaten without periodically stocking up on lives at certain enemy-respawn points (i.e. cheating). There are like, no comments on this page for a game of this magnitude. I was never a Contra kid. Never owned one, played it once at a friend's house. Now in my twenties, with a friend: HOLY CRAP! This is so awesome and intense. Because of this game I have found a love for run and gun games. So Gunstar Heroes and Turrican are now top picks of mine. Love it! Buy it! Gunstar Heroes puts this to shame. Serious and punishing - a combo that is exactly what I don't want from a videogame. best run n gun game EVER! ...even thought gunstar heroes is still freaken awesome! This was one of those games that if you played it on the hardest difficult setting, it was simply impossible to complete. Spot on Contra III. 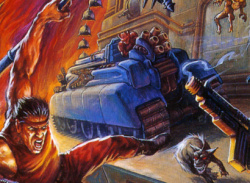 Contra III is a great update to the classic Contra formula. The intense action and varied gameplay make it rise above all the other countless run and shoot games out there.